We are pleased to inform the needy students who are enroled in various public sector unviversities that National Bankof Pakistan in Pursuant to the announcement made by the Federal Finance Minister in his 2001-2002-budget speech, a STUDENTS LOAN SCHEME (SLS) for Education was launched by the Government of Pakistan in collaboration with major commercial banks of Pakistan (NBP, HBL, UBL, MCB and ABL). Under the Scheme, financial assistance is provided by way of Interest Free Loans to the meritorious students who have financial constraints for pursuing their studies in Scientific, Technical and Professional education within Pakistan.Such loans are almost intrest-free based with respect to maturity. NBP Educational Loan Online Apply Application Forms Download from this page respectively. He/She has obtained admission on merit through normal course/procedure in the approved Universities/Colleges of the public sector mentioned hereunder. Paid directly to the Boarding expenses excluding meal charges University/College Procurement of textbooks Disbursed directly to the student Repayment. The maximum period of repayment of loan is 10-Years from the date of disbursement of first installment. the date of first employment or one year from the date of completion of studies, which ever is earlier. Allama Iqbal Medical College, Lahore Main Branch Lahore. Fatima Jinnah Medical College for Women, Lahore Main Branch Lahore. Government College University, Lahore Main Branch Lahore. King Edward Medical College, Lahore Main Branch Lahore. Kinnaird College for Women, Lahore Main Branch Lahore. Lahore College for Women University, Lahore Main Branch Lahore. National College of Arts, Lahore Main Branch Lahore. University of Education, Lahore Main Branch Lahore. University of Health Sciences, Lahore Main Branch Lahore. University of Veterinary and Animal Sciences, Lahore Main Branch Lahore. Virtual University of Pakistan, Lahore Main Branch Lahore. University of Punjab, Lahore New Garden Town Branch Lahore. 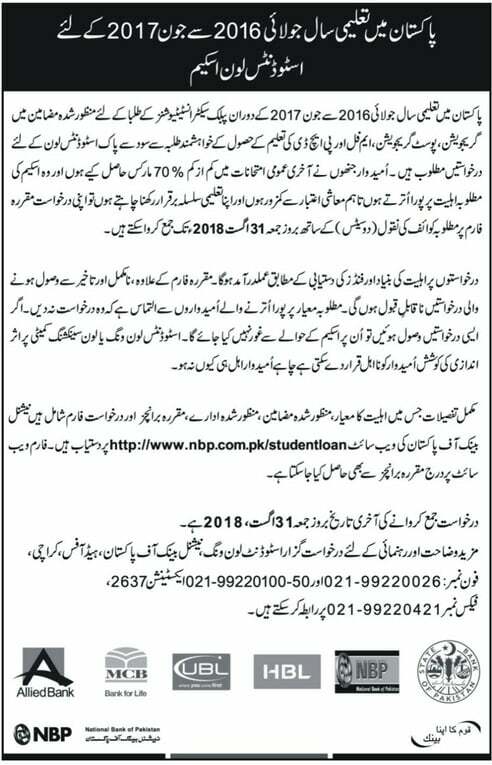 Last to apply for student loan scheme or Qaraz e Hasna is 31st August,2019.